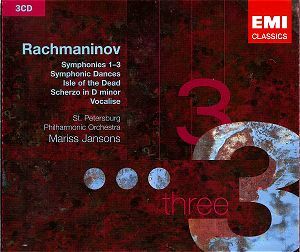 Musically these recordings are always better than dependable and often brilliant - an attractive buy with three discs at bargain price. This is part of a whole raft of EMI’s triples which vies with the long established Universal Trio range. The First Symphony is tautly controlled and dynamic like the ripping back of giant drapes to reveal a darkling plain where ignorant armies clash by night. Stormy and angry - parallels with Svetlanov here - the strings are finely grained without the aureate weight and claustrophobia of Ormandy's Philadelphia set (Sony Essential Classics) yet also without the emotional rawness Svetlanov (Warner). The finale has a tight and sharply etched rhythmic rap. The effect en masse is big though not opulently toned. The Isle of the Dead breathes and laps - a black oleaginous welling up. It reminded me of Herrmann's music for the 'Rosebud' episode in Citizen Kane. Vocalise is tender and rich - as good as Previn's 1970s version but more controlled than the Moffo/Stokowski on BMG. Jansons' Second Symphony is cogently argued with surprising impressionistic touches. It has a swart muscular swell and rise suggestive of threat and foreboding. The recording of the Third Symphony showcases the exceptional dynamic range of these discs. In it Rachmaninov is most like Bax with many a shudder and gently coaxing susurration. In the second movement (at 10.20) comes the first indication of Russian vibrato from the French Horns. I was pleased to hear it. The first flute of the St Petersburg is breathtakingly flighty if not quite up to Philadelphia standard. This is an orchestral showpiece par excellence yet as poetic as any of Rachmaninov's romances. The symphony ends in a colossal gallop. While the Third Symphony is very good, Jansons' Symphonic Dances are even better. The orchestra croaks, squawks, stalks and whispers and when it picks up speed there is no loss of definition. The oboe duet with the saxophone in the first dance is most poetically done. The Second Dance is an accentuated hyper-Prokofiev, psychological waltz with touches of Tchaikovskian regret (Eugene Onegin). The flute swirls impress but are not as artificially close as those of the classic 1960s Kondrashin (Melodiya). The brass have a most imperious presence. In the final dance the orchestra's split-second gatling attack has a vicious edginess and smashing defiance with a walloping thump to the climactic blasts. This is a grand conception luxuriantly executed though it lacks the iron will Kondrashin brought to his Moscow recording. Connoisseurs of the symphonies will go for Svetlanov, Previn, Ashkenazy or Ormandy; the latter on Sony Essential Classics is my personal top choice - though I am torn between this and the old BMG-Melodiya Kondrashin. The Second Symphony can be had in a smashing though rather rapid version by Jose Cura (Avie) and there’s an impressive and expansive but effective wallow by Kurt Sanderling (Warner Elatus). The Symphonic Dances are fervently done by the otherwise rather languid Polyansky on Chandos and now as part of a stunning bargain double on Brilliant Classics. Of the symphonies the Third as well as the Symphonic Dances and The Isle of the Dead are superb. The other two symphonies receive very good readings. Everything is accorded a lively recorded image and the trilingual notes by Andrew Huth complete an attractive purchase.